The Spring 2015 Meeting of the MD-DC-VA section of the MAA was be held at Roanoke College on April 24-25, 2015. On Friday afternoon, Caren Diefenderfer of Hollins University and Meagan Herald of VMI ran a workshop on building a Menger sponge by folding business cards. On Friday evening, Tim Chartier of Davidson College gave the banquet address, Linear Thinking: from bracketology to computer graphics. The Saturday morning address, The Symmetric Group and Fair Division: Does Knowledge Matter?, was given by Brian Hopkins of St. Peter's University, and the Saturday Afternoon Address, Geometry: Old and New, was given by Will Traves of the U.S. Naval Academy. Abstract: This fall the Museum of Mathematics in New York and Queen Mary University of London sponsored the MegaMenger project. Twenty international sites agreed to start building a Level 3 model of the Menger Sponge by folding business cards, with the hope of completing the project by the end of October. 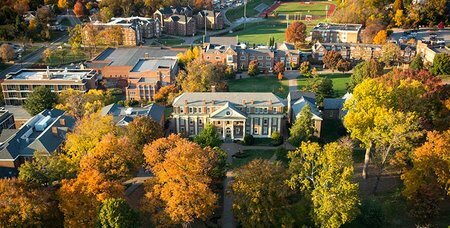 Two of the sites were Hollins University in Roanoke, VA and Virginia Military Institute in Lexington, VA. We both made good progress and are continuing to build this semester. Caren Diefenderfer (Hollins), Meagan Herald (Virginia Military Institute) and a few of their students will lead this workshop. We will give a short introduction to fractals and then explain how to fold business cards to create the Menger Sponge model. Please bring 100-150 old (recyclable) business cards with you. (The cards that work the best are not shiny or flimsy.) Each pair of participants should be able to complete a Level 1 Menger Sponge during the workshop. Feel free to visit www.megamenger.com for more specifics on the October international project. Caren Diefenderfer received her AB from Dartmouth College and her MA and PhD from the University of California at Santa Barbara. 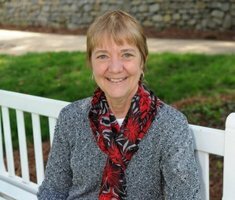 She has been a member of the Hollins Mathematics Department for over 30 years. 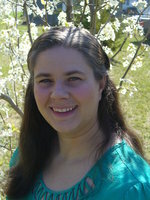 She has always enjoyed connecting mathematics with music and/or fiber arts and has offered "Mathematical Knitting" and "The Music and Mathematics of Change Ringing" in the Hollins January short term. This fall she taught a first year seminar course titled "Games, Puzzles and Logic." The class studied patterns and spent one day on fractals. The MegaMenger project was a natural fit and the students bonded with one another while building the Menger Sponge. Meagan Herald, an associate professor of mathematics at the Virginia Military Institute, is an applied mathematician trained in mathematical biology, whose research uses mathematical models to understand the mechanisms of chronic respiratory inflammation. She appreciates the mathematics that can be found in seemingly non-mathematical mundane activities and adores sharing these encounters with interested individuals of all ages. In addition to mathematics, she enjoys teaching ballet, watching sci-fi and reading a variety of books. Abstract: What's in a matrix? Enter the world of linear systems and see how matrices open the door to a diverse array of topics, from creating a March Madness bracket, to analyzing a car's aerodynamics, to rendering cinematic special effects. We'll also discuss how to engage students majoring in math and other fields to think linearly. Biographical Sketch: Associate Professor of Mathematics and Computer Science at Davidson College, Dr. Tim Chartier specializes in data analytics. Working with Davidson College students, he supplies analytics for the men's basketball team at the college. He's also supplied analytics to men's and women's soccer, volleyball and football. Beyond the college, Tim's consulted on sports analytics problems for ESPN's Sport Science program, the Weather Channel, the NBA and a fantasy sports site. Tim frequently consults businesses on data analytics questions. In 2014, Tim was named the inaugural Math Ambassador for the Mathematical Association of America, which also recognized Dr. Chartier's ability to communicate math with a national teaching award. His research and scholarship were recognized with the prestigious Alfred P. Sloan Research Fellowship. Published by Princeton University Press, Tim wrote Math Bytes: Google Bombs, Chocolate-Covered Pi, and Other Cool Bits in Computing and coauthored the textbook Numerical Methods: Design, Analysis, and Computer Implementation of Algorithms. The Mathematical Association of America published Tim's recent book When Life is Linear: from computer graphics to bracketology. Tim has also been a resource for a variety of media inquiries, which include appearances with NPR, the CBS Evening News, USA Today, and The New York Times. Saturday Morning Address:The Symmetric Group and Fair Division: Does Knowledge Matter? Abstract: Sports drafts and divorce settlements are examples of situations where players take turns selecting indivisible goods. Like other topics in fair division, the situation is made more interesting because people may value the goods in different ways. In this talk, we focus on the case of two players, where the machinery of permutations is surprisingly applicable. How many possible outcomes are there? In what circumstances do both players get their best possible outcomes? How can one best take advantage of knowing the other's preferences? What happens when a player's motivation switches from greed to spite, the common good, or selfless altruism? In this colorful talk, we'll sample some applied algebraic combinatorics and address these issues along with the provocative question of the title. 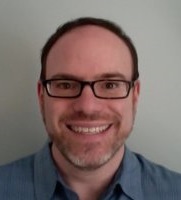 Biographical Sketch: Brian Hopkins is a professor of mathematics at Saint Peter's University in Jersey City, New Jersey, and teaches game theory and fair division at New York University as an adjunct in the department of politics. He is also active in teacher professional development, especially with the Institute of Advanced Study's Park City Mathematics Institute. Research interests include combinatorial number theory, Ramsey theory on the integers, and mathematics applied to social science. Hopkins is the editor of The College Mathematics Journal and received the 2015 Deborah and Franklin Tepper Haimo Award for Distinguished Teaching of Mathematics. Abstract: In 1639, a sixteen-year old Blaise Pascal generalized a result that had stood for over 13 centuries. The posters announcing his Mystic Hexagon Theorem inspired geometers to think about infinity in new ways that still resonate today. I'll describe how Pascal's work influenced modern Projective Geometry. Along the way we'll see how computer software mixes with 19th century methods to create a new environment for mathematical research. This line of ideas gives us a new way to think about straightedge and compass constructions. I'll describe recent research with David Wehlau that leverages work of Cayley and Bacharach to produce a surprising construction that checks whether 10 points lie on a cubic curve. I won't assume much mathematical background; the talk should be accessible to anyone that's ever computed the determinant of a matrix. Biographical Sketch: Will Traves obtained his Ph.D. from the University of Toronto in 1998, working with Mark Spivakovsky and Karen Smith. Following a brief post-doc with Bernd Sturmfels at U.C. Berkeley he settled at the U.S. Naval Academy, where he currently serves as Chair of the Mathematics department. Together with Amy Ksir and Andrew Bashelor, Will won both the Hasse and Ford prizes for mathematical exposition from the MAA. His recent Math Monthly paper on constructible curves also won the Halmos-Ford prize. Will is a Project NExT brown dot and a former editor of our MAA section's newsletter. He loves playing chess, backgammon, and other games with a mathematical bent.